On Saturday, October 29th, San Francisco’s week-long Come Out and Play Festival starts with the 3rd annual Halloween edition of Journey to the End of the Night. San Francisco’s second annual Come Out and Play Festival will transform the city into a giant playground once more with an expanded week long line-up of over 15 real-world games. Showcasing more local designers than ever before, this year’s festival emphasizes creative, site-specific games like Undercover Capture the Flag, and strategic, city-wide games like Journey to the End of the Night. In addition, the Come Out and Play Festival will invite players to sample games from across the spectrum, including street games, site-specific games, smartphone-based pervasive games, and alternative sports. 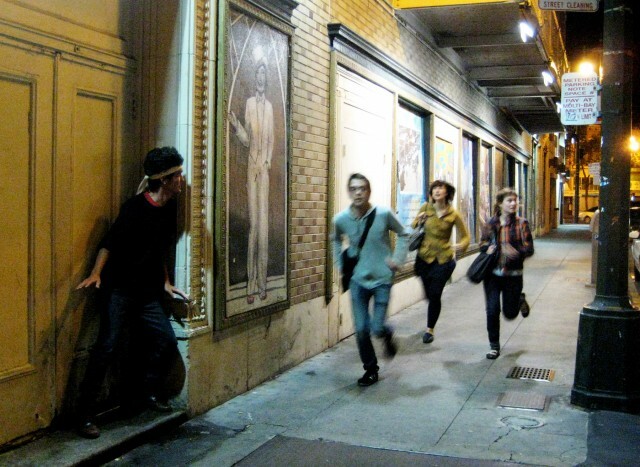 The 2011 festival will kick off with the third Halloween edition of Journey to the End of the Night, an epic chase through a series of artist-created checkpoints scattered across San Francisco, which last year attracted 1,300 players. This year, Journey organizers will present a new format featuring nonlinear checkpoints and the Chaser Killer, a new character designed to terrify chasers as they pursue their targeted players across the haunted cityscape. Winners will, as always, be feted and praised at the final checkpoint’s atmospheric outdoor party. JTTEOTN starts at 7pm at Justin Herman Plaza. Check the schedule for all other Come Out and Play games. All the games are free to play.